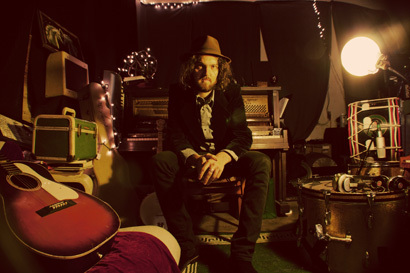 Melbourne’s Jordie Lane returns from an extended stint in the U.S. to release his second album, Blood Thinner. To celebrate its impending release on Friday, July 15th (Vitamin Records), Jordie is thrilled to announce a national tour with more than 20 dates across our great big land in July and August. After spending much of the last year baking in the Californian desert, Jordie Lane’s second LP takes a sharp and unique turn away from his critically acclaimed studio debut, Sleeping Patterns. Completely stripped back to the bare bones of recording techniques, the tracks on Blood Thinner were captured between a remote desert motel room, a basement and, finally, a bleeding hot garage in Eagle Rock, LA. Responsible for almost every sound on the recording, Jordie creates some truly unique sounds using everything from kitchen utensils, wine glasses, boxes and banjo skins, and even a fan-powered harmonium found on the side of the highway for $10. Co-produced and mixed by multi Grammy Award winner Tom Biller, (Beck, Kanye West, Karen O), and mastered by Grammy award winner Reuben Cohen at Lurssen Mastering, Hollywood, Blood Thinner is a record that travels across landscapes with gospel choirs, near-techno beats, campfire folk songs, bluegrass and West-coast country. It’s the journey of a lonesome traveller dealing with such heavy themes as anxiety, betrayal, guilt and sinning. Drifting between the lines of love and money, and always staying true to Jordie’s storytelling prowess. "When I first landed in America I knew I needed a purpose... After a short stay in LA I found myself on the road again headed towards Joshua Tree, the spiritual home of the late Cosmic Country King, Gram Parsons. This is a short tale of my journey there, and a little insight into what lit a fire inside me to unexpectedly make my second solo album 'Blood Thinner". Click here to watch Jordie Lane and his band perform exclusively for The Age at The Wick rehearsal studios in Brunswick. Join Jordie Lane on Facebook here! “Channelling Parsons, Springsteen and Van Zandt, Lane is an exceptional talent. Jordie Lane's stay at the Joshua Tree Inn was a hauntingly inspirational experience.